It was a beautiful day for fieldwork. 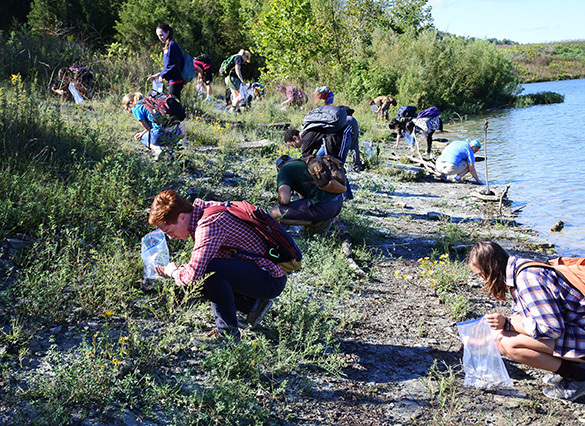 Every fall I take Wooster’s Invertebrate Paleontology class into the field to collect specimens for study and analysis during the rest of the semester. It’s fun because these students have only completed two weeks of the course and almost everything is new. One steady change over the years has been in the number of paleo students. Gone are the days when we could all pile into a 15-passenger van and spend three days in Kentucky. Now we have to take a bus, and tight student schedules limit us to one day. These constraints mean that going to Caesar Creek Lake in Warren County, Ohio, is the best choice. We’ve been here now several times. here we examine Ordovician fossils in limestones and shales of the Waynesville, Liberty and Whitewater Formations (all of which equal the Bull Fork Formation). The weather was ideal, but the night before saw heavy rains. Bit of a mud fest today. Here we’re at our main collecting site in the Waynesville at the lakeshore (39.482788°N, 84.052376°W). The fossils, of course, are world-class in the Cincinnati area. 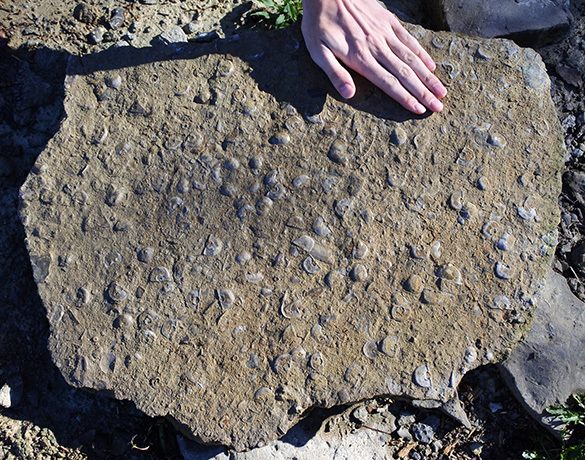 Here’s a wonderful slab of strophomenid brachiopods with Josh Charlton’s hand for scale. At least the rains washed the rocks clean! 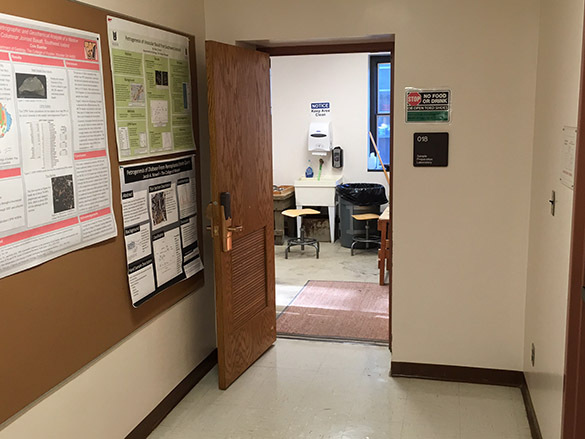 Next stop for the students: washing their specimens in the lab sink at Wooster. Anyone who has worked in the Cincinnatian knows that the clay can be particularly tenacious. Students learn paleo from the very basics!